Captain Minie’s efficient new bullet ushered in the era of modern weaponry–at a fearful price for both North & South. The 124th New York Volunteers called themselves the “Orange Blossoms”–others called them a fearless “regiment of heroes”. A young Army lieutenant named Ulysses S. Grant faced his first test of command in the steaming hot jungles of Panama. The crowd lining the French seashore was in a holiday mood–it was a perfect Sunday for watching a sea-battle. The Rebel trenches at Petersburg seemed impregnable–until inventive Union engineers stepped in. The resulting blast was heard for miles. The daunting citadel of Fort Fisher stood guard over the South’s last open port at Wilmington, North Carolina. A joint Union task force intended to slam it shut. 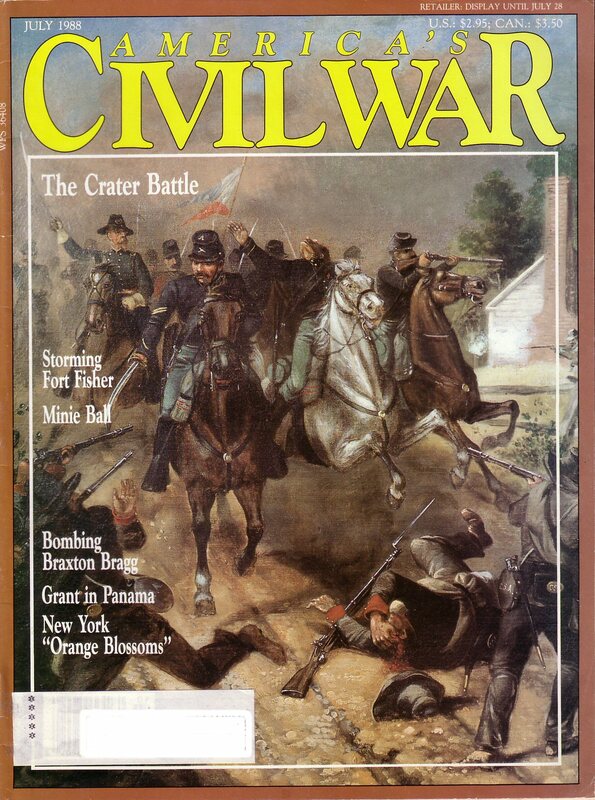 Defeat followed Confederate General Braxton Bragg wherever he went–except for one shining hour at Chickamauga. Even then, he wasn’t sure he had triumphed. Vicksburg was the key to control of the Mississippi. Is this volume available for purchase? No it is not. I just post what articles are in the magazine.